The ‘Gossip Girl’ star, 26, her husband, 37, who celebrated their first wedding anniversary in September 2013, were seen smiling for photos outside the Viceroy Resort with friends and staff members last week, Daily Mail reports. 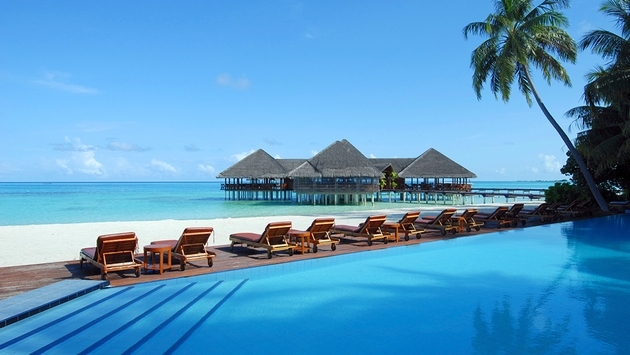 Viceroy Maldives is surrounded by over 17 acres of palm trees and sand encircling a crystal-clear blue lagoon. How romantic! This video paints the picture even better. Viceroy Maldives provides the right amount of seclusion and luxury set within a spectacular locale. Five dining venues offer everything from casual beachside cuisine, Pan Asian and European flare to intimate fine dining experience with a wine cellar and a private chef's table, the resort’s website boasts. And there’s no need to worry about gaining a few pounds from the endless amounts of food. To burn off those unwanted calories, the resort also offers a number of activities, including a wide range of water sports, both motorized and non-motorized. Guests can arrange deep sea fishing trips, enjoy a sunset cruise to a deserted island, or explore the sea by Jet Ski, kayak, water-skis, windsurfing, wake boarding or catamaran sailing. With all of these emenities, there’s really no reason to leave the resort. We can certainly see why Blake and Ryan chose the destination for their romantic getaway. And if you're going to make the trip, here's 17 more attractions to work into your travel itinerary so you can say you've fully seen the getaway destination.